Today I join the OLW Blog Hop for Ali Edwards’ One Little Word class. After loving the January assignment I really struggled with February’s. It might be because my word, renew, means a whole bunch of different things to me. Or maybe that it’s hard to take literal pictures of “renew” in the dead of a Chicago winter. Plus a bout with the flu in my house and major work challenges meant I was unfocused and not taking photos like usual. I ended up with fewer than the 9 pictures suggested, so I made a photoshop collage with what I had. I use Photoshop CS3 and since I am still a total amateur my layout is very basic. I put the photo of the textbook in the middle of the layout because its going to be a huge focus in my life over the next 3 months. I’ve worked in HR for 6 years with no formal HR training or background – I moved into an HR role with my current firm after being in client service for years. 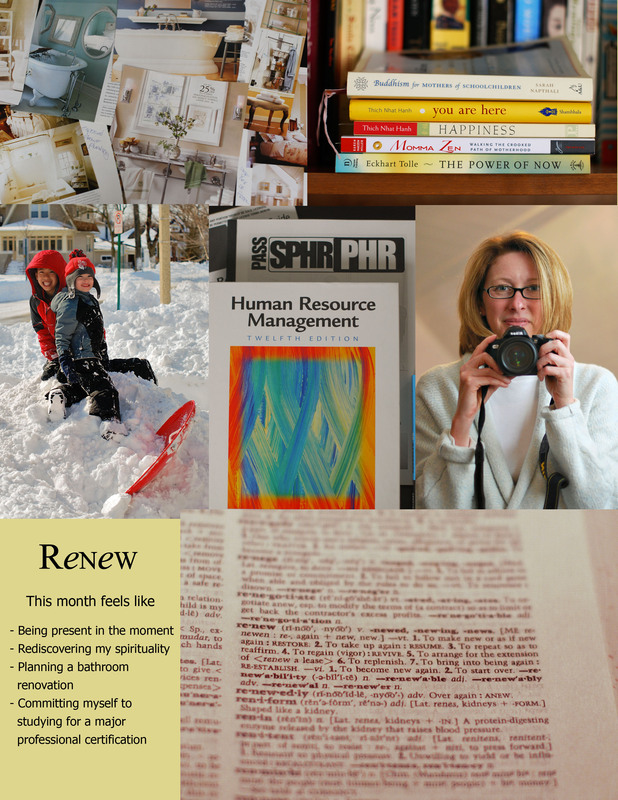 I’ve known that I needed to study for and get my SPHR certification (Senior Professional in Human Resources) but haven’t wanted to invest the months to study. Well, as part of my commitment this year to self-renewal I’m finally doing it. I just signed up (and paid the $425 registration fee) and will take the test in May. Yikes! Thanks for stopping by! Your next stop on the OLW Blog Hop is Tere at http://terecontodomicorazon.blogspot.com. Here is a complete list of blogs participating in this month’s blog hop! (The blog hop will go live by all participants no later than 8 AM PST).